Proteasome inhibitor-based induction is the standard of care in newly diagnosed multiple myeloma (NDMM) patients eligible for melphalan 200 mg/m2 followed by autologous stem cell transplant (MEL200-ASCT), but the treatment of patients with high-risk disease still represents an unmet medical need. The second-generation proteasome inhibitor Carfilzomib proved to be effective, either in combination with Lenalidomide-Dexamethasone (KRd) or with Cyclophosphamide-Dexamethasone (KCd). The primary endpoint of this analysis was to evaluate the response rate of KRd vs KCd induction. 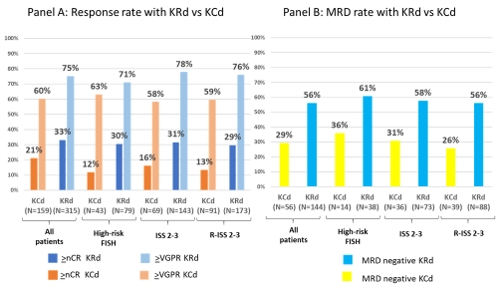 Secondary endpoints were: 1) rate of minimal residual disease (MRD) negativity with KRd vs KCd; 2) efficacy of KRd vs KCd in different subgroups of patients according to baseline prognostic features: International Staging System (ISS), chromosomal abnormalities, and Revised-ISS (R-ISS). NDMM patients ≤65 years were randomized (1:1:1; stratification ISS and age) to ARM A: 4 28-day induction cycles with KCd (carfilzomib 20/36 mg/m2 IV days 1,2,8,9,15,16; cyclophosphamide 300 mg/m2 days 1,8,15; dexamethasone 20 mg days 1,2,8,9,15,16) followed by MEL200-ASCT and consolidation with 4 KCd cycles; ARM B: 4 28-day cycles with KRd (carfilzomib 20/36 mg/m2 IV days 1,2,8,9,15,16; lenalidomide 25 mg days 1-21; dexamethasone 20 mg days 1,2,8,9,15,16) followed by MEL200-ASCT and 4 KRd cycles; ARM C: 12 KRd cycles. Primary endpoint was very good partial response (VGPR) rate with KRd vs KCd induction. MRD evaluation - 8 color second generation flow cytometry, sensitivity 10-5 - was performed. For this analysis, the 2 KRd groups were pooled (2:1), since the treatment was the same until that point. Enrollment was completed in March, 2017. Data cut-off was November 30, 2017. 474 patients were randomized (KRd, n=315; KCd, n=159) and analyzed. Patients characteristics were well balanced with 49% KRd vs 49% KCd patients presenting at baseline with ISS Stage II/III, 31% vs 35% with high-risk chromosomal abnormalities [del17 and/or t(4;14) and/or t(14;16) detected by FISH], and 68% vs 74% with R-ISS Stage II/III disease. Rates of stringent complete response (sCR)/complete response (CR) (14% vs 4%; P=0.0004), ≥ near CR (nCR) (33% vs 21%; P=0.0106) and ≥VGPR (75% vs 60%; P=0.0017) were significantly higher with KRd vs KCd. Partial response rate was 97% with KRd and 91% with KCd and only 1% of patients in each group was primary refractory. The advantage of KRd vs KCd was consistent in all the analyzed subgroups (Figure, Panel A). MRD evaluation was available in a subset of patients (144 KRd patients and 56 KCd patients). Rate of MRD negativity on evaluable patients was 56% with KRd vs 29% with KCd (P=0.008). MRD negativity in high-risk patients treated with KRd was comparable to the overall population (Figure, Panel B). Treatment was well tolerated, as previously presented (Gay F. ASCO 2017). K-based induction in transplant-eligible patients is well tolerated and induces deep responses. KRd induction significantly improved sCR/CR, ≥nCR and ≥VGPR vs KCd. Rate of MRD negativity on evaluable patients was also higher with KRd. The regimen was similarly effective in high-risk patients, currently representing an unmet medical need.